Jutting out into the frigid water of Lake Superior, the Keweenaw Peninsula in Michigan’s U.P. 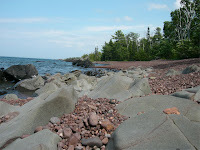 is the home of the tiny town of Copper Harbor. It is a beautiful and quiet place with a population of around 32 bona-fide, year-round residents. In the summer it is a haven for kayaking and mountain biking and for simply relaxing and exploring the landscape which is what I intend ed to do for a few days as I traveled the western half of the U.P. After spending the morning under an overcast sky sifting through wave-polished stones on the rocky shore of Hunters Point, my sister and I stopped for an enormous lunch at Harbor Haus. Sitting at a table in front of a wall of windows providing a panorama of the largest of the Great Lakes, we stopped talking as the view began to change. An eerie silence blanketed the restaurant as others started to take notice of the scene before us. The water at the shore outside the window seemed to be receding steadily. The occasional clinking sound drew attention to the quiet as people set down their silverware and stared at the lake. 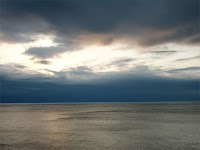 In the distant horizon, where storm colored water met grey sky, a shadow was moving toward us. The moment we all realized what we were seeing, a strange calm settled over the room. Without words, we all began to stand, staring transf ixed at the shadow, a moving wall looming larger and larger in the closing distance. No one questioned what we were seeing. No one said a word. No one panicked or tried to run. Silently, each person looked around at others standing around them. I met the eyes of two men standing at a nearby table, a waitress holding a pitcher of water by the bar, and finally my sister standing next to me. As those around us started to do the same, we clasped hands with each other, then with whoever stood near enough to reach. Looking out the glass wall one last time at the lake and the shadow that was close enough now to see just how quick and violent our destruction was going to be, I closed my eyes knowing that every one of the people around me, who I now felt an inexplicable love for, was doing the same. Thank you. I did actually have this dream about a year after I visited this place for the first time. It was so vivid I will never forget it. WOW ! Goose bumps. B.